Most UK higher education history departments offer MRes or MPhil/PhD qualifications, allowing a student to concentrate their research interests on the period for a year of study or more. These qualifications are awarded on submission of an individual research thesis, and prospective students should contact individual members of faculty staff to discuss their research interests before submitting a research proposal. 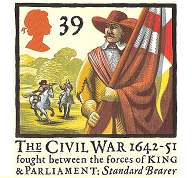 Each of the main exam boards in England, Wales and Scotland offer the study of the English Civil War as an option as part of their A-Level qualification in History. Syllabuses allow teachers a fair amount of flexibility to choose pathways through to the qualifications, and the units below also vary in terms of the weighting allotted to them and form of assessment. Please see the syllabuses for more details. Britain, 1625–1642: the Failure of Absolutism?